The mission of Copps DiPaola Silverman, PLLC is to provide skilled advocacy and knowledge to our Clients. We work to educate our clients about the law and their options. At Copps DiPaola Silverman, PLLC we believe that clients are best served when they have the knowledge to make informed decisions throughout their cases, are fully engaged in strategy discussions, and participate in cost benefit analysis of potential actions. We have remained uniquely focused, by design. Our concentrated practice areas allow us to provide personalized service that is tailored to each client’s specific needs. Our Albany, NY lawyers and staff will know your name. We’ll also know your goals and work together to achieve them. We care. We are committed. That’s the small firm difference. Legal matters are intensely personal and often have a long-term impact on your life or that of your loved ones. We understand that your legal matter is important to you. We work hard to help give you the greatest measure of control over your legal matter. We are dedicated to providing you with the individual attention, responsiveness, and professional care that you deserve. Your case is as important to us as it is to you. At Copps DiPaola Silverman, PLLC we believe that as a client, you deserve to understand your legal rights, the legal process, and the options available to you throughout the process. We fully believe that being knowledgeable about the law allows you to make the best decisions for yourself, your family or your business. We are committed to insuring that, as a client, you are educated and able to make informed decisions every step of the way. Our Albany, NY attorneys are trained to be able to address your matters through traditional litigation or through alternative dispute resolution options like settlement conferences and negotiations, collaborative divorce, or collaborative law. We will work with you to find the best way to approach your matter – whether it is negotiation, mediation, collaborative law, litigation, or some hybrid approach that is best suited to achieving your desired outcome. We care about finding the best solution for you. Legal representation can be expensive. We understand this reality and do everything possible to make sure that your case is handled in the most cost-efficient manner possible. The roots of Copps DiPaola Silverman, PLLC date back to 1995 when Anne Reynolds Copps opened a solo practice at our 126 State Street office. In 2014, Anne and her daughter, Kathleen (“Casey”) Copps DiPaola, created Copps DiPaola, PLLC, the first mother-daughter law firm in the Capital Region. In 2018, as Anne transitioned to an Of Counsel role in the firm, Casey created a new partnership with Lorraine R. Silverman, along with associates Kayla Molinaro and Joseph R. Williams. Copps DiPaola Silverman, PLLC is the go to firm in New York’s Capital Region for adoption, family law, guardianship and estate planning/probate matters. Our firm has a long-standing relationship with the Pride Center of the Capital Region as its pro bono counsel and our firm is welcoming to all members of the LGBTQ community. Barry A. Gold Law Firm Leadership Award: In October 2007, the firm received this award from The Legal Project in recognition of the pro bono contributions that the Firm made to The Legal Project’s programs. 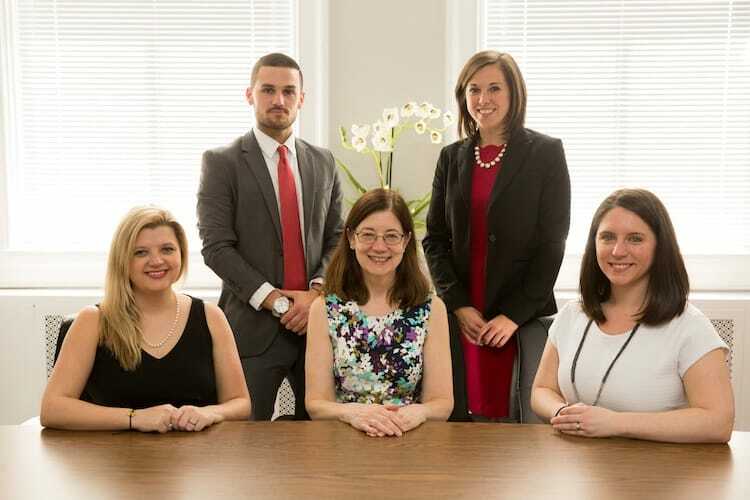 Albany’s Finest: In 2013, the Metroland named the Firm one of Albany’s Finest for its comprehensive adoption practice. View our Profile. Selected to a two-year post graduate clinical fellowship position with Albany Law School where she worked exclusively in the field of family law with the co-author of the treatise of N.Y. Law of Domestic Violence. Distinguished Member Award, Capital District Women’s Bar Assoc. Kimberly A. Troisi-Paton Leadership Award, Capital District Women’s Bar Assoc. Attorney Professionalism Award, New York State Bar Assoc. Pro Bono Award, New York State Bar Assoc.